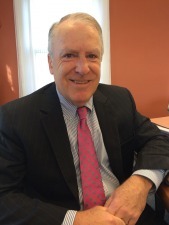 Attorney Michael P. Deneen is a partner in the law firm of O’Malley, Deneen, Leary, Messina & Oswecki. He graduated with honors from Boston College with a B.A. in English in 1981 and received his J.D. from The University of Connecticut School of Law in 1984. He was admitted to the Connecticut Bar in 1984 and the Bar of the United States District Court, District of Connecticut in 1985. He is a member of the Connecticut Bar Association, the Hartford County Bar Association and the Connecticut Trial Lawyers Association. Mike practices in the areas of plaintiff’s personal injury law, criminal law, commercial and residential real estate and estate planning and probate. He has represented individuals, small businesses and banks at O’Malley, Deneen, Leary, Messina & Oswecki for over thirty years. He has also served as an Assistant Town Attorney for the Town of East Hartford. In addition to his law practice, Mike has been a co-owner of the Union Street Tavern since its establishment in Windsor in 2006. He coordinates the Union Street Tavern Trot, a charity road race that has raised over $100,000.00 for Alex’s Lemonade Stand Foundation in its fight against pediatric cancer. He has served on the Board of the Windsor Jaycees, St. Gabriel School and St. Timothy Middle School. He currently serves on the Board of First Town Downtown and the Windsor Chamber of Commerce. He and his wife, Jennifer, reside in Windsor and are the parents of five daughters and one son.